We’d already eaten half of them by this point. This is the first Good Friday since we changed our diet to a more paleo variety. Three meals of hot cross buns in one day is not good for us. I’m going without gluten and, this week, without dairy either. There was a special offer on salmon sides at the supermarket, so we had salmon for dinner, which was delicious. But I wasn’t going to have a Good Friday without something that at least resembled hot cross buns. I can find various recipes for gluten-free hot cross buns, but the ones that actually seem like they’d actually make something close to hot cross buns involve gluten-free flour, xanthan gum, and other things I really don’t have time to experiment with. Plus I’d rather keep to paleo principles if possible. 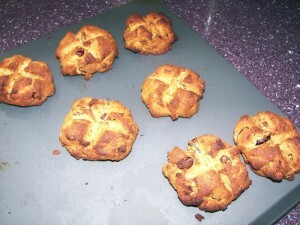 So I found this recipe, which says it makes paleo gluten-free hot cross buns but in reality makes little cakes which are reminiscent of hot cross buns. I had to adapt the recipe somewhat: I couldn’t find a couple of the ingredients locally (macadamia nut oil? Come on! ), one ‘pinch’ of cinnamon is nowhere near enough spice, and I don’t believe chocolate has any place in any form of hot cross bun. So here’s my version. If you’re careful with the dried fruit you use it would be SCD friendly too. Cream the coconut butter and honey together to a fluffy paste, then add in the beaten eggs in stages. Mix all the other ingredients together and stir into the egg mixture with a metal spoon. Shape into balls and place on a greased baking sheet. Cut a cross in the top. Bake for 20 minutes or so at 160°C. Serve warm, with butter (of the coconut or milk variety depending on preference and tolerances). How did they taste? Well, despite having (at his own insistence) a few shop-bought glutenous hot cross buns for his own use, Robin ate several of these instead while I was out!